When I was in Johor Bahru doing my teacher’s training stint, I had Ainur, a Malay and Ting, a Sarawakian as my housemates. People find it weird to have a Muslim Malay girl staying with 2 Christian Chinese girls. But hahaha, we are happy together and most of all, we clicked!! She was rumoured to be eating the "inedible"
while staying with us. But nope, she never did that. Both Ting and I, are very sure that didn't happen. We cooked at lot, and I was the executive chef, with Ainur being the sous chef. Ainur loved Chinese food and both Ting and I will eat anything. We learn a lot from each other during this 11 months of staying together. I learnt to cook masak lemak cili api, noodles pancake (to be featured later), and of course, today's dish from my good Malay buddy. While Ting was a newbie in the kitchen, she soaked and soaked up whatever we were doing in the kitchen, equiping herself with culinary knowledge to be brought back to Sarawak later on. Talk about cooking... hahaha. It reminds me of the stove cabinet. When we moved in, the house was bare, because we were the first tenants. It was totally bare besides whatever is given by the developer. And being girls who love to cook, we had to find a way to put the gas stove. Buy a table? Use chairs? Buy a Cabinet? The last idea was crazy, buy a cabinet to be used for 11 months?? One day, while Ainur and I were passing by the dumpster of our apartment, to my surprise, I saw a stove cabinet. In acceptable condition!!!! I quickly asked Ainur to stop the car and pointed to the cabinet. She quickly parked the car nearby and both of us tiptoed to the dumpster. And quickly moved the cabinet up to our 10th floor apartment. Luckily no one saw us throughout the long journey. Well it feels longer cos we're being sneaky. When we got back to the car, both of us were laughing our hearts out, as if we're both half crazy. When our friends drop by our house, they were surprised to see us having a stove top cabinet. Haha, we just kept quiet about our "steal" from the dumpster. And one thing about staying with Ainur. People always thought that she's the Chinese and I'm the Malay. Cos whenever we go out together shopping, salesgirls will always talk to her in Chinese and me in Malay. Both of us will be laughing and laughing, and that would make the salesgirl blush. Ainur also taught me about Minang culture, the way the inheritance goes to the girls instead of the boys, and wedding preps, how does it go about. I learnt a lot while staying with her, the good and the bad. The bad being "curses" or "reared ghosts" that is prevalent among the people she knows. A real eye opener to me. One weekend, Ainur got up early and cooked us breakfast, Nasi Goreng Kampung, a Malay styled fried rice. 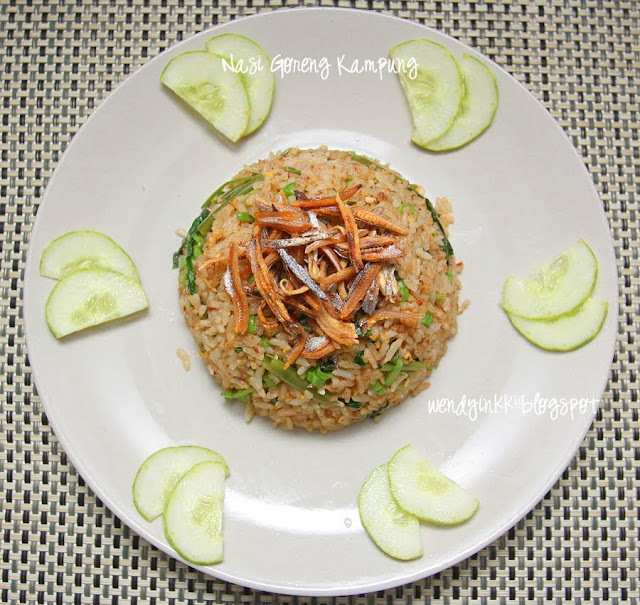 Long beans, water convolvulus and dried anchovies are always featured in the Malay cooking and it comes together in this fried rice. This is not my first time eating this, thai-styled Malay restaurants have this in their menus and I’ve eaten this countless times. But she made it real good, and she told me how she did it. Pulverizing the anchovies as well. Ah ha!!! 1. Puree everything in (A) except oil. If you can’t get it smooth, add the oil, stir and blend again. It’ll get finer. 2. Heat wok on medium heat. 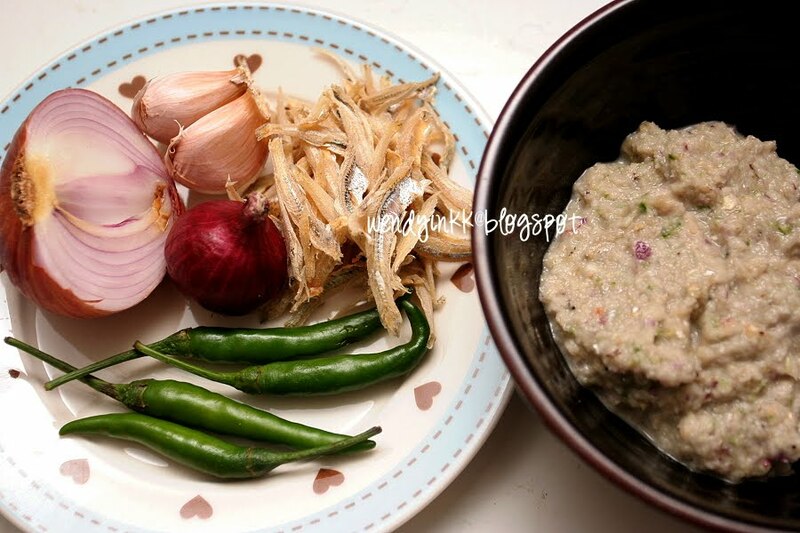 Put in oil and fry anchovies until golden, drain and dish up. 3. With remaining oil in wok, put in (A) and 1 tsp salt and carefully fry it until it turns golden. 4. Put in rice and turn the heat on high. Toss until it looks even, push the rice aside. 5. Crack your eggs and put it in the center. Spread the eggs around. Immediately push the rice onto the eggs and toss the rice, making sure the eggs at the bottom are all brought up and broken up. Fry for a while. 6. 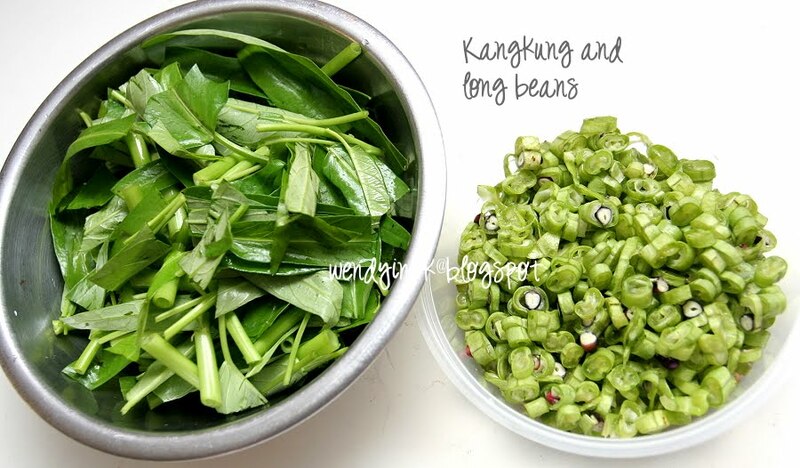 Put long beans into rice and toss for 15 seconds, followed by water convolvulus. Toss again for 5 seconds, not too long. Dish up and serve. Ingredients (A) Grind anchovies separately. Method Step 3: Add in powdered anchovies when the aromatics have turned slightly golden. Of course you may alter the recipe or ingredients as you wish, as fried rice is fried rice. But once the anchovies, long beans and water convolvulus is missing, it no longer ressembles Nasi Goreng Kampung, but just an ordinary fried rice. IMPO. For me, if there are no prawns or cha siew in Yong Chow Fried Rice, should it bear the name of Yong Chow Fried Rice?? Or no tomatoes in bolognese.... Or use Szechuan preserved vegetables in Teochew Steamed Fish instead of salted mustard? I can't... and this is just me. I'm submitting this to Merdeka Open House 2010 hosted by Babe_kl in conjuction with Malaysia's 53rd Independance Day. Yummy! I love fried rice. I actually ate it for lunch today and I couldn't stop eating it. lol Yours looks very tasty. I like to cook this kampung style fried rice when I run out of idea what to cook especially weekend, simple and delicious! Hi Cher(short for teacher), my husband loves this kind of fried rice especially with ikan bilis. You don't know how my little humble home stinks each time I fry ikan bilis, at least 500g. Extra for snacking! He will surely drool if he sees your pics. Sedap! This looks delicious! So many different ways to cook fried rice. I have to try this soon. Wendy, my daughter name is Jeslyn, I just forgotten to mention in my post, hehehe..will amend it. 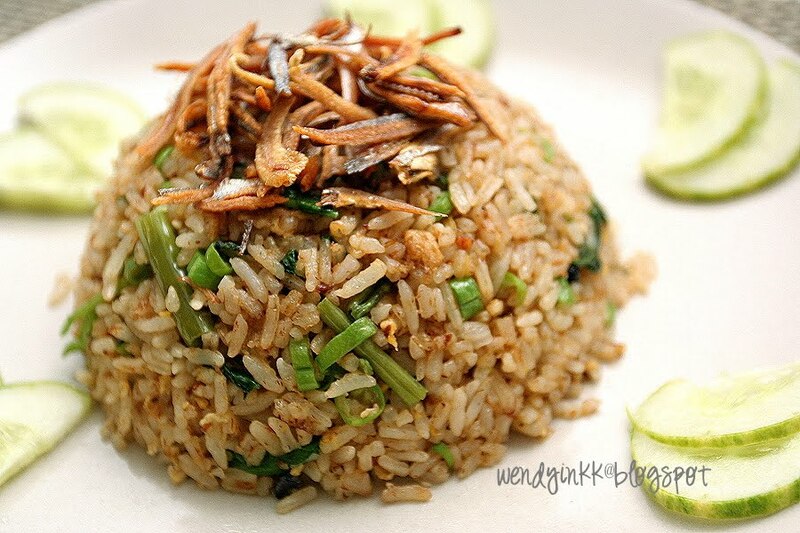 Ive never tried Malay's fried rice before and this looks delicious and simple. I definitely like to cook this for my family, thanks! Thanks. I guess in our Asian roots, fried rice is always a favourite. 500gm is a lot of bilis!!! Woah!!! Yup, a lot of ways. And this is a typical Malay way. Hehe, those big wok fried rice uses a lot of "additives" like bilis cube. And that definately makes it tasty. Haha. 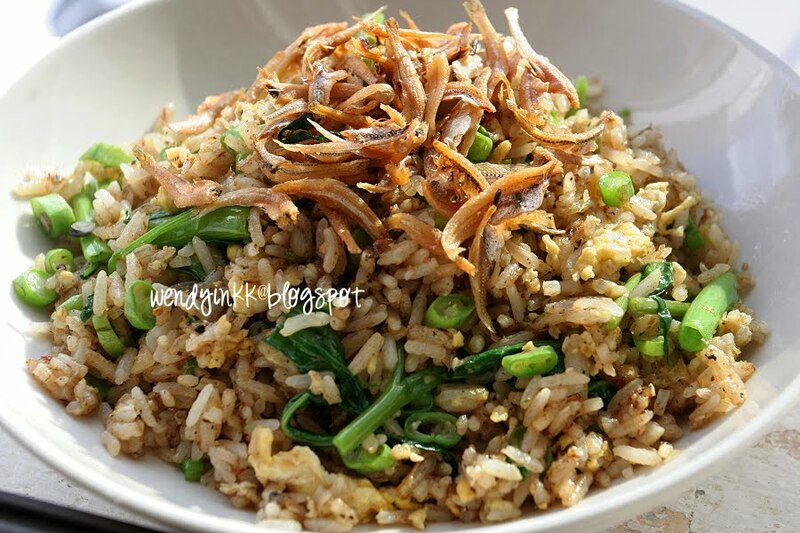 the bilis is the soul of this fried rice... do cook this again with your favourite recipe. Sure do!! Hope they like it. That is a very nice story, Wendy. Thanks for sharing it with us. I too love hanging around my Malay friends and their family. I've learned a lot of traditional kampong dishes from them. Well, haha, who isn't greedy when it comes to food we love? We'd definately want more and more of it. Sure no prob. It's good for us to learn about other cultures. Haha, be prepared for 2 more stories to come. I'm actually submitting these for Merdeka Open House, hosted by Babe_kl. Actually I didn't write so much about Ainur in the beginning, but since I'm submitting this to the event, I better write more. True... it's nice to learn from each other. Wendy, I am not sure is my previous comment being posted successfully or not cos I have been encountering prob with the internet access for the past few days, on and off the internet connection will cut off. It has been taking me more than 2 hrs but just able to surf a few blo :(. Blood boiling now, wanna call starhub to give a big scolding but the lines always cant get thru even I patiently hold for more than 30 mins until cut off argh!!! Wendy...you know I love this rice very much. I can eat this everyday if I am allowed to...my canteen make the most beautiful nasi goreng kampong. I have to cut down on rice intake..hahaha thanks for the recipe. Now I can cook this at home when the kids are back. One dish meal is what I am looking for now. Hooked on dramas....poor Daddy! Talking about kampung fried rice! I just made one at 6am this morning for hubby. I was trying to widen my eyes with some toothpicks when I started to prepare the ingredients. Very sleepy! haha.... But I never blend the ingredients. I keep everything dry & nice. Maybe one day I'll try the puree version. Even my Malay sis-in-law doesn't cook this often! This is the one you mentioned in my blog, finally get a chance to see it. Looks good, I'll try to cook it one day. My hubby will be happy if I cook this for him everyday!!! He loves one dish meals. It works both ways, you from me and me from you. Haha, maybe she don't like this?? BTW, the pureed bilis makes the kitchen smell when doing fried rice with it. Haha, yeah. This is the one. Haha, I've always been a good cook, sudah lupe ka?? Just that I've only started baking seriously not too long ago. Hey Wendy, I saw the last picture being used as a menu photo in a cafe in Bangsar. I know it's yours because of the water mark. Thanks for telling me, no wonder my nasi goreng kampung has so many hits now, LOL. If they are daring enough to put it up and telling the world the picture is not theirs w/o removing the watermark, LOL, I don't know what to say. They just got themselves busted. Hi i would like to try out this recipe. Do u use overnight rice or already cooked rice made on the same day? Most recipes for fried rice use overnight rice. If you use overnight rice, I advise you not to use overnight rice that wasn't kept in the fridge to stay safe. Bring them to room temperature before frying the rice. Personally, I don't see what's the difference, as long as the rice isn't hot, not soft not soggy, it will fry up nicely. great tasting fried rice!fried it extra longer to get that burnt taste! thanks!